We’re sure you are familiar with flying drones, but have you heard of a floating drone? As part of the Gold Creek Restoration Project we used a boat drone to gather the floor topography (bathymetry) of Gold Creek Pond. Why do we need to know that? We will be using data such as floor depth to develop a comprehensive plan to restore the pond so it isn’t negatively impacting Gold Creek. From collecting data on Gold Creek we have learned that Gold Creek Pond is a significant contributor to the dewatering of Gold Creek occurring on an annual basis. Dewatering consists of a section of a creek or river drying up and becoming disconnected. This harms bull trout, a species in danger of disappearing from the upper Yakima River Basin. Dewatering reduces the amount of habitat for young bull trout and inhibits adults from traveling from the lake to their spawning grounds to reproduce. 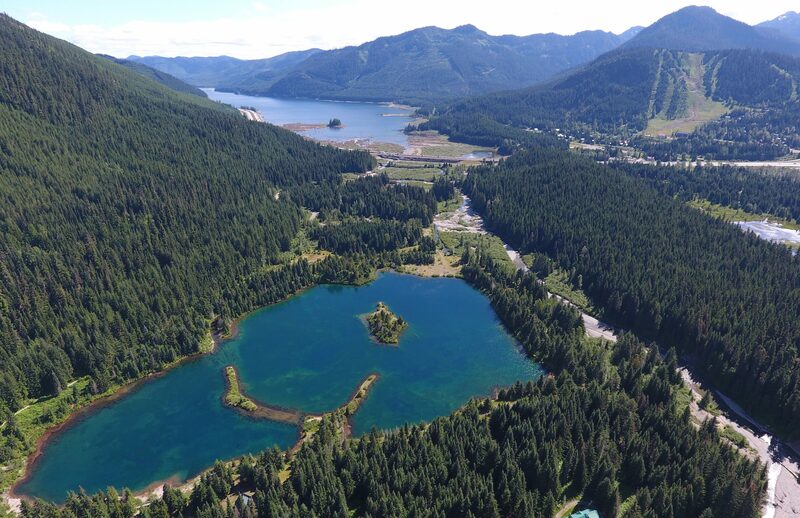 Gold Creek Pond was formerly a gravel pit that WASDOT used to harvest material for highway construction in the 1980s. It takes up approximately 90% of the floodplain (shown in blue) and is approximately 50 feet at its deepest point. Because of its depth and size, the pond disconnects Gold Creek from a significant amount of water entering from the eastern side of the valley. Some of the water entering from the eastern side is redirected in a channel (shown in yellow) that WASDOT created when they were utilizing the gravel pit. The remaining water enters the pond and then exits through a man-made outlet (shown in red). The depth of the pond is a significant part of the problem. As a rule water moves in the path of least resistance, which is the lowest point in its path. At a depth of 50 feet, Gold Creek Pond is the lowest part of the floodplain and it pulls water away from Gold Creek. As a result, in drier months of summer there is not enough water to keep the creek wet and it becomes disconnected. Gold Creek Pond isn’t the only contributor to dewatering in Gold Creek. A history of logging and mining has led to widening of the creek. Instead of having a narrow channel, water is spread out across a wide bed making it more likely to go subsurface. Logging on the stream banks removed wood from the system, a key piece to creating habitat suitable to fish like bull trout. Wood in streams generates scouring that creates pools were young fish can rest and find shelter from predators. 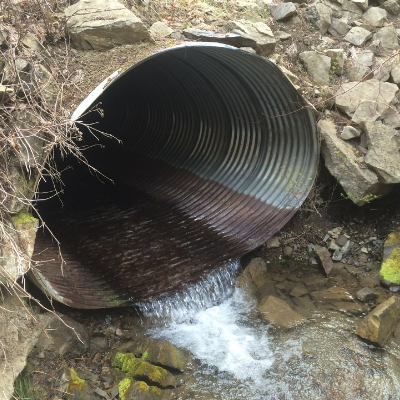 Kittitas Conservation Trust is looking at the big picture of restoring habitat in Gold Creek. 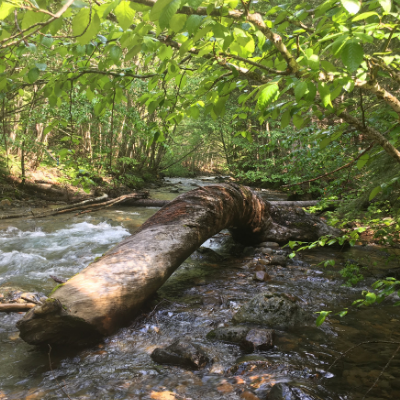 Working with Natural Systems Design, a river restoration engineering firm, we have developed plans for in-stream restoration on approximately 1.1 miles of Gold Creek. The in-stream portion of the project is expected to use over 1,200 pieces of wood and add over a mile of side channel habitat. 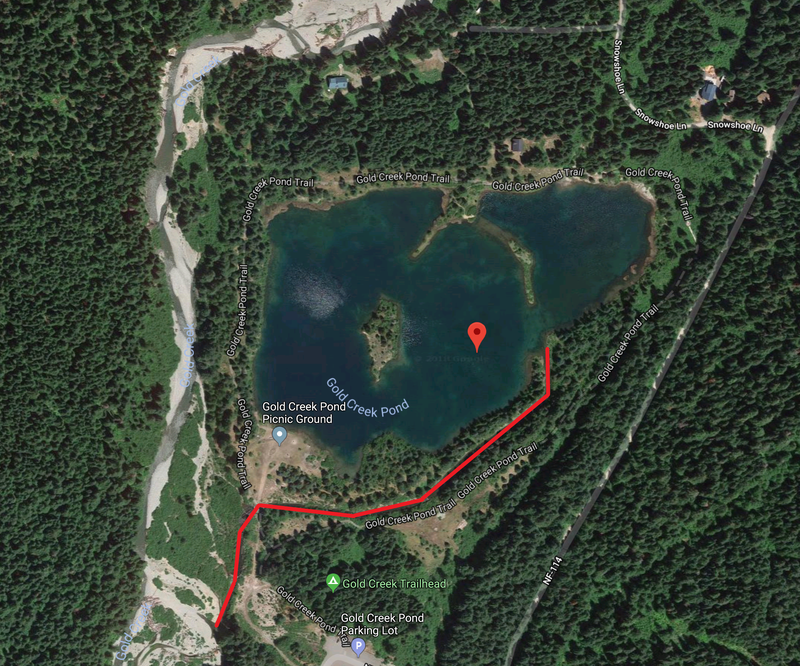 We are also working on developing restoration alternatives for Gold Creek Pond that enhances habitat and the recreational uses that take place there. 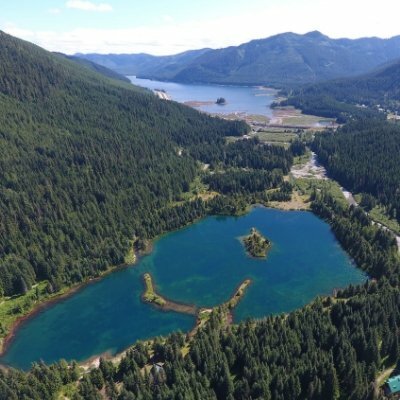 One piece of that puzzle is knowing what the floor of Gold Creek Pond looks like using a drone boat. The drone boat sends a signal down to the bottom of the pond, which translates to a depth. The boat drone taking off on Gold Creek Pond. 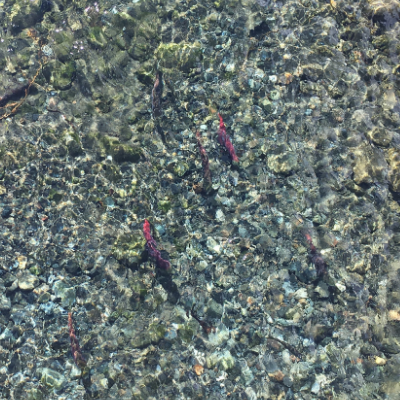 Kokanee spawning in the Gold Creek Pond outlet channel. In December, we will be hosting a design charrette for Gold Creek Pond. At the charrette, experts, engineers, recreational groups, and others will develop meaningful restoration alternatives. Using information such as the pond’s bathymetry, participants will identify the top two or three restoration plans, which NSD will convert these into designs.